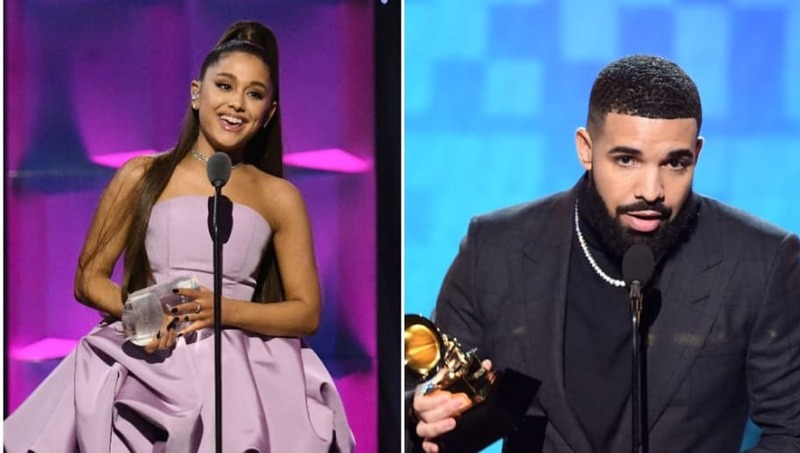 As Ariana Grande has collaborated with a plethora of popular artists--such as Big Sean, Childish Gambino, and more recently 2 Chainz--it's almost hard to believe she's never worked with the chart-topping Drake. But a recent social media development has fans speculating the day is coming. Twitter account @PopCrave discovered Ariana and her manager, Scooter Braun, both recently followed the rapper on Instagram, which was met with follows back. Fans instantly started buzzing over a potential collab, with one writing on Twitter, "collab of the year is coming, a win for ariana stans!" Another tweeted, "omg the king and queen of streaming, I see the # 1 for 100 weeks." Before you start thinking fans might be reaching with assuming a collab is coming, another major hint has occurred. As @PopCrave pointed out later, Young Money--Lil Wayne's record label which represents Drake--responded to the Instagram follows with an emoji. Something must be in the works between the two amazingly successful artists--and we're just left wondering why it hasn't happened sooner.